With direct proof of common intention to a crime by a group of persons seldom available, it is sufficient if the prosecution is able to adduce circumstantial evidence to link them to the offence, the Supreme Court has said. A CBI special court today gave four to seven years’ imprisonment to 11 accused in the fodder scam. Security has been beefed up at the world famous monument Taj Mahal following reports of threat from a Pakistan-based terror outfit. Revenue secretary K.M. Chandrashekhar, a 1970 batch Kerala-cadre IAS officer, will take over as the new Cabinet Secretary here tomorrow. A Samajwadi Party leader was shot dead here today by unidentified persons and the incident triggered protests by party workers who fought a pitched battle with police. Notwithstanding the bandh called by the Khasi Students Union (KSU) and opposition from two NGOs, the Meghalaya government managed to hold public hearing on uranium mining today. Two abducted Indian engineers working for an oil exploration company in Nigeria have been released after 25 days in captivity, though, there is no information on the whereabouts of 10 more kidnapped Indians. Four Indian students have been selected for the International Biology Olympiad beginning in Canada this week. In a tragic incident, a 14-year-old boy was killed when his classmate dashed his head against a wall for refusing to lend a pen. In view of the rush of passengers during summer, the Railways has increased the passenger carrying capacity of two pairs of Rajdhani trains linking Bhubaneshwar with New Delhi. The Centre today marked the 6th World Day against Child Labour by announcing its plan to extend the National Child Labour Project (NCLP) across the country during the 11th plan. Hundreds rally to raise awareness about child labour. Sayali Bhagat has also joined the Bollywood bandwagon. “Direct proof of common intention is seldom available and, therefore, such intention can only be inferred from the circumstances appearing from the proved facts,” a bench of Justices Arijit Pasayat and D. K. Jain said, while dismissing an appeal of certain accused challenging their life conviction in a murder case. According to the prosecution, accused Manik Das and four others hacked to death Anil Das in Jorhat district of Assam on December 27, 2000, because of to previous enmity. The Jorhat sessions court convicted Manik Das and the four others to life imprisonment after holding them guilty for offences committed under Sections 302 (murder) and 34 (common intention) of the IPC. Appeal preferred by the accused was dismissed by the Guwahati High Court, following which the accused filed the criminal appeal in the apex court. The accused took the plea that the prosecution failed to establish their presence at the scene of crime and the witnesses, who testified against them, were all relatives of the deceased and hence tutored to depose against them. Rejecting the arguments, the apex court said: “To bring home the charge of common intention, the prosecution has to establish by evidence, whether direct or circumstantial, that there was a plan or meeting of mind of all accused persons to commit the offence.” The bench said the existence of a common intention amongst the participants in a crime is the essential element for application of Section 34 (common intention). According to the bench, the provision of Section 34 is intended to meet a case in which it may be difficult to distinguish between acts of individual members of a party who act in furtherance of the common intention or to prove exactly what role was played by each of them. Special CBI judge Manoranjan Kavi also imposed fine on them that ranged from Rs 10,000 to Rs 1 lakh. Former regional director Dr O P Divakar of the Animal Husbandry Department was sentenced to seven years’ rigorous imprisonment and a fine of Rs 1 lakh. The CBI court gave the verdict regarding the scam relating to Godda treasury in undivided Bihar from which Rs 55 lakh had been illegally siphoned off. Former veterinary officer Ajit Kumar Sinha was given seven years’ imprisonment and a fine of Rs 50,000 while former treasury officer Rakesh Sinha and budget and accounts officer Brajbhushan Prasad were sentenced to four years’ imprisonment and a fine of Rs 50,000 each. Supplier Tripurai Prasad and four others were given four years’ imprisonment. “There is an intelligence report of a terrorist’s presence in Agra. Therefore, security has been tightened around Taj Mahal, which attracts a large number of tourists” said senior police superintendent Hari Ram Sharma. Intelligence agencies from time to time issued specific directives regarding terrorists’ activities and the present threat perception is one such case, Sharma said. Prime Minister Manmohan Singh hosted a lunch for outgoing Cabinet Secretary B.K. Chaturvedi whose one year extension as the country’s top-most civil servant comes to an end. Chandrashekhar was India’s ambassador to the World Trade Organisation in Geneva before taking over as revenue secretary in October past year. The assailants shot and killed SP’s youth wing district president Amar Nath Yadav when he was coming out of the party office in the Bal Niketan Tiraha area, the police said. The borders of the town have been sealed and a massive manhunt has been launched to nab the culprits. enmity could be the reason behind the killing, police said. Yadav’s murder triggered strong protests from the SP workers, who led by party MP Chandradeo Rajbhar, blocked traffic on the main road and also indulged in stone pelting. The police resorted to a lathi charge to disperse the mob in which several persons injured. According to an official source in Shillong, the public hearing on uranium mining was held peacefully under heavy security at Nongbah-Jynrin at Mawthaba in West Khasi Hills district. The source further informed that people from different walks of life had sufficient opportunity to air their views for and against uranium mining in the state. The views aired by the people were recorded and the same would be sent to the Union Ministry for Environment for further action. The public hearing was conducted by the Meghalaya State Pollution Control Board at the instruction of the Union government. The KSU, Meghalaya Peoples Human Rights Council and Langrin Youth Welfare Association have been sternly opposing uranium mining at Domiaset, where the uranium ore is located, on the grounds that it will lead to the degradation of environment and public heath. However, the Congress-led Meghalaya Democratic Alliance (MDA) government took a firm stand that the public hearing must be held under any circumstances, as it was essential to know the views of the public over the vexed issue. Uranium Corporation of India Limited (UCIL) had applied for permission to mine uranium in Meghalaya in 2001. There is an estimated reserve of over 9,500 tonnes of uranium oxide in about 9.22 million tonnes of ore spread over an area of 2 square km. Fire engineer Debashish Kakoty and his colleague Sunil Dave, employed by Indonesia’s Indorama, were released late last night with 11 other hostages. Kakoty’s elated father Ajit Kakoty from Sivasagar in Assam told PTI that he had learnt of the release of the two men, abducted on May 19, from his daughter-in-law Lata. Rebels fighting for control of oil resources in that country’s Niger Delta region had abducted Kakoty and Dave from their residential quarters in Port Harcourt. Out of the total 15,000 contestants across the country, four were selected by the Indian National Biology Olympiad (INBO), National coordinator Vijay Singh said today. The students participating in the 18th Biology Olympiad in Saskatoon, Canada from July 15 to July 22 are Anurag Chahal from Gurgaon, Anurag Shahi from Ludhiana, Devanshu Bansal from Jaipur and Kalyani from Chandigarh. The Olympiad is a unique event designed to discover, encourage and challenge exceptionally gifted young students from all over the world. Over 65 countries are expected to participate this year. IBO was initiated in 1990 and India started participating in it since 2000. 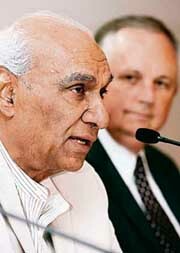 The Homi Bhabha Centre for Science Education (HBCSE), here, had been a nodal centre for training and selecting students for the Biology Olympiad since 2000, Singh said. Singh said the selection procedure of the Indian team began in November 2006. As many as 15,000 students from across the nation registered for the first level examination, of which 314 students were selected for the second level examination namely, the INBO examination. Mahendran, a class IX student at Government Higher Secondary School in Puduchhampalli, 62 km from here, met with the tragic end yesterday, the police said. When Mahendran refused to hand over his pen to his classmate Vinod, the latter pushed him and his head hit against a wall. The boy fell unconscious and was rushed to a nearby private hospital where he was pronounced brought dead. The body was brought to the Mohan Kumaramangalam hospital yesterday night. The head-master of the school handed over Vinod to the police, which registered a case against him for causing death by negligence. According to the Northern Railway, the 2422/2421 New Delhi-Bhubaneshwar-New Delhi Rajdhani Express has been augmented by an additional air-conditioned three-tier coach with immediate effect to run up to June 25 from New Delhi and June 27 from Bhubaneshwar. The scheme under which children withdrawn from work are sent to special schools, is at present operational in 250 child labour endemic districts in 20 states, an official said. Almost 7,328 special schools were functioning for over 4.20 lakh children withdrawn from work in these districts, the official pointed out. At the special schools children withdrawn from work are kept for a maximum period of three years to prepare them to join the regular education system, provide education, vocational training, nutrition, stipend and health care facilities. Since the NCLP scheme became operational in 1988, nearly four lakh children had been enabled to join the formal education system, the official said. During the 10th plan, the Budget allocation for the scheme was more than doubled, from Rs 249.60 crore in the 9th plan to Rs 602 crore during the 10th plan, and subsequently the NCLP projects were enhanced from 150 to 250 districts. Besides the NCLP scheme, the government was also implementing the scheme of grants-in-aid to voluntary organisations for the benefit of children withdrawn from work in the districts, which were not covered by the NCLP scheme, the official pointed out.